Yeah, I’m kinda one of those oversharey types on Twitter and Tweetbot is the first thing I launch every morning so it has to be my No.1. Tweetbot allow me to manage lists and hashtags and to follow conversations easily. Whenever someone says, “why won’t Twitter let me X”, or “my Twitter client won’t let me Y”, I usually think, well Tweetbot can do that. 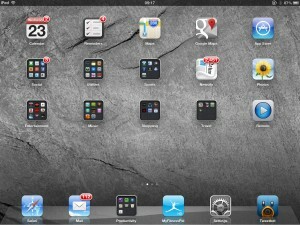 The fact that there’s also a really nice OSX app out that syncs across iOS and OSX devices is also a cracking feature. Get up, read Twitter, cycle to the station, sit on a train for just under an hour, read stuff collected on Google Reader using Newsify. Newsify can sync up to 5000 articles, download posts and their images, share posts just about everywhere and has a really nice looking newspaper layout that allows you to skim over lots of articles very quickly. I’ve tried several other apps but I keep coming back to Newsify. Work time now! I probably couldn’t live without Evernote now. It’s often referred to as a spare brain and that’s certainly how I treat it. Meeting notes go into it, records of phone conversations go into it, clippings of web pages, restaurant menus, ideas, booking references, pretty much everything including starting recently all of my letters and bills scanned in as PDFs. It’s all tagable and because the Evernote servers run OCR through the PDFs the entire library is searchable. I’ve got Evernote installed on 2 laptops, 1 desktop and 2 mobile devices so that wherever I am I’ve got it all with me. Another work app and another one that syncs across multiple devices so I probably use this one as much on my laptop as I do on my iPad (or phone). OmniFocus is task management and project organisation. To be honest it can do way more than I use it for and my workflow would probably benefit from learning how to use it better but for the moment it’s great at keeping everything me and my team need to do all together to allow me to sort and reorganise them easily. OK, so the Virginmedia iPad app doesn’t allow you to watch TV on the go but it does allow you to fully manage your TiVo box from anywhere, including adding new recordings and series links, as well as deleting existing recordings and seeing what the box is going to record in the future. If you’re at home and have your TiVo connected to the same network your iPad is on you can even use it as a remote. To be honest, using the iPad app for the TiVo is better than using the remote and on-screen guide! Outliner (£2.99) – an outliner app that can take in the output from iThoughts HD to allow you to do some reorganisation before exporting the whole thing as text ready to deliver as a project/email/presentation?? Textastic (£5.99) – brilliant editor, multiple language syntax highlighting and what a brilliant addition the the keyboard…Apple, tale note! Netflix (free, subscription required) – you really need me to explain this one? OK, so the film content may not be great but the TV series they’ve got loaded up on here certainly is. Enscripted (69p) – a simple game where film quotes and titles are scrambled by transposing letters…all you have to do is unscramble them. You only get 1 film a day and damn is it addictive! MyFitnessPal (free) – I’m currently on a diet, and I mean it this time, and this app is helping hugely! Simply a calorie and exercise logging app but one that’s very nicely put together.